You are currently browsing the archives for the tag 'Paraíba Tourmaline'. 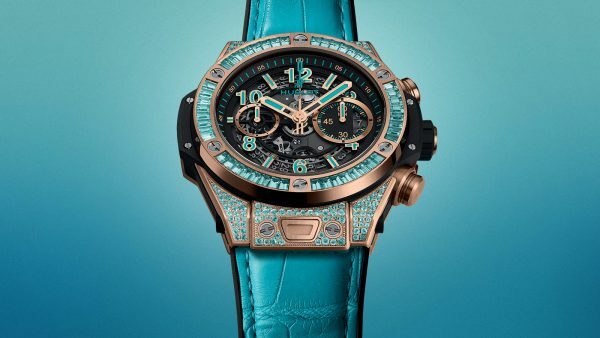 For the first time ever, a watchmaker has decorated a watch with the turquoise brilliance of a cuprian elbaite. 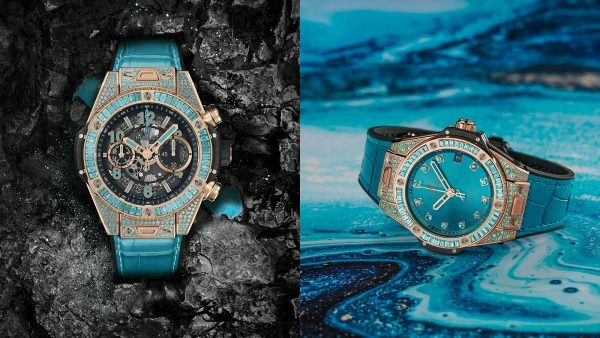 Hublot has electrified its Big Bang with the naturally vibrant and intense colours of the Paraíba Tourmaline, a stone whose rarity can only be fully appreciated when learning that, on average, a single Paraíba Tourmaline is mined for every 10,000 diamonds. 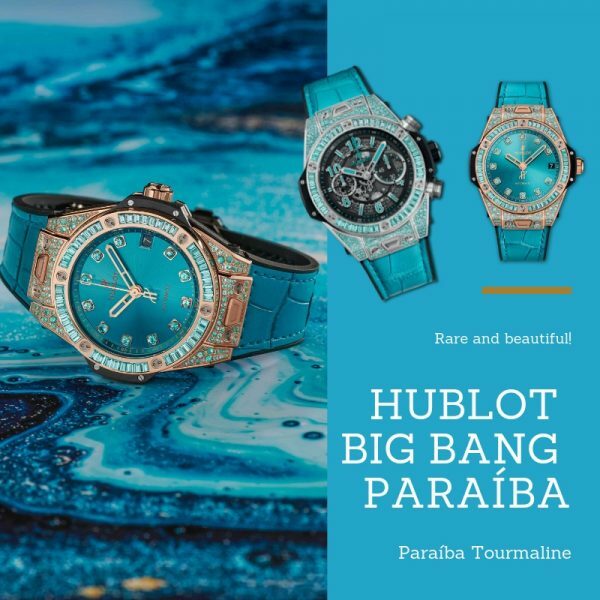 Certified by the world’s largest gemmological laboratories, the Paraíba Tourmalines set into Hublot’s Big Bang are mined from the Rio Grande region of Brazil. Thanks to its long-term partnership with Pierre Salanitro, Hublot benefits from an exclusive agreement with a mine that operates in an environmentally sustainable way, and complies fully with local and international governing ethics. The mine strives to preserve the earth that yields this unique material, and is committed to reforestation of the region, only using clean water for its extraction operations to prevent soil pollution. While the Paraíba Tourmaline is an extremely rare stone, certain cuts are more exclusive than others. One such example is the baguette cut, which requires stones of a perfectly uniform colour. This is why five times more raw material was required for the initial stone selection, and also why, when each stone was baguette-cut, only 70% of these could be set – 30% were rejected due to breakage or insufficiently uniform quality or colour. This stone, more fragile than emerald, requires considerable expertise and dexterity both to cut and to set, and the process can take up to three times longer than that for a diamond. 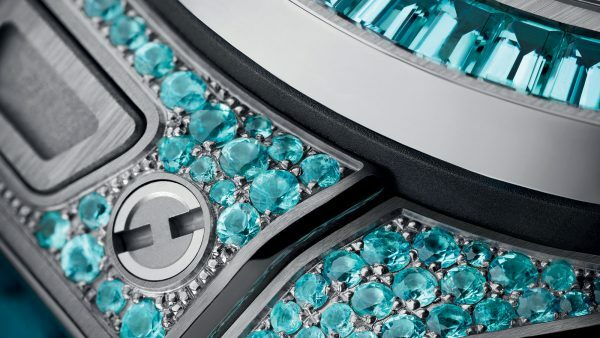 A blue that radiates green, a turquoise reminiscent of a blue lagoon whose depth is enhanced by sunshine, the colour of a Paraíba Tourmaline changes thanks to its extreme sensitivity to light. 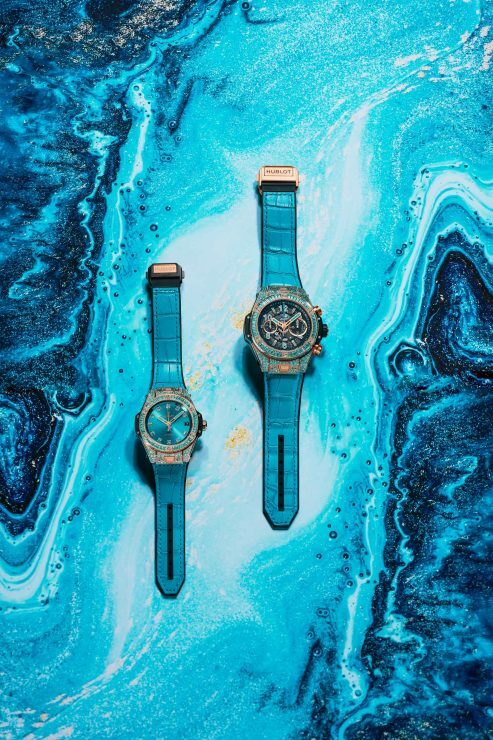 A watch you can’t take your eyes off, that almost invites you to dive in.